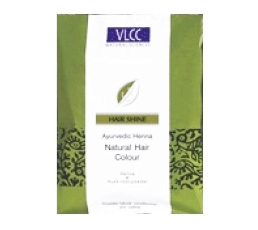 Buy VLCC Ayurvedic Henna (mehndi) natural hair colour. Natural conditioning and Lustre. Conditioning and Nourishing of hair. Traditionally the symbol of passion and love, harbinger of wealth & prosperity, warder off of unhealthy influences – Henna, the herb of Drive Grace! Now brought to you by VLCC, in a secret traditional recipe for the beauty of your crowing glory. Gives shine & luster, darkens hair color and promotes hair growth Enriched with Natural Proteins and Vitamins C & E – nourish the roots Musk Root – promotes growth Margosa – fights all scalp infections Indian Gooseberry – adds shine & luster. Make paste with water. Apply to dry hair half an hour before washing. Lawsonia Intermis (Henna) 83%, Emblica Officinalis (Indian Gooseberry) 5%, Melia Azadirachta (Margosa) 5%, Nardotachys Jatamansi (Musk Root) 5%, Acacia Concinna (Shikakai) 2%.